row 1: turn. ch 1, 2 sc, *skip 3 chs, 7 dcs in next st, sk 3 chs, 3 scs* ; repeat from * to * ending with 2 scs. row 2: turn. change to color b, ch 2. dc4together over (sc, sc, dc, dc), *ch 3, 3 scs, ch 3, dc7tog over (dc, dc, sc, sc, sc, dc, dc)*; repeat from * to * across, ending with dc4tog over (dc, dc, sc, sc), sk tch. row 3: turn. ch 2. 4 dcs in dc4tog, *sk ch-3, 3 scs, sk ch-3, 7 dcs in dc7tog*; repeat from * to * across, ending with 4 dcs in dc4tog, sk turning ch. row 4: turn. change to color a, ch 1. 2 scs, *ch 3, dc7tog (over dc, dc, sc, sc, sc, dc, dc), ch 3, 3 scs*; repeat from * to * across, ending with 2 scs, sk turning ch. 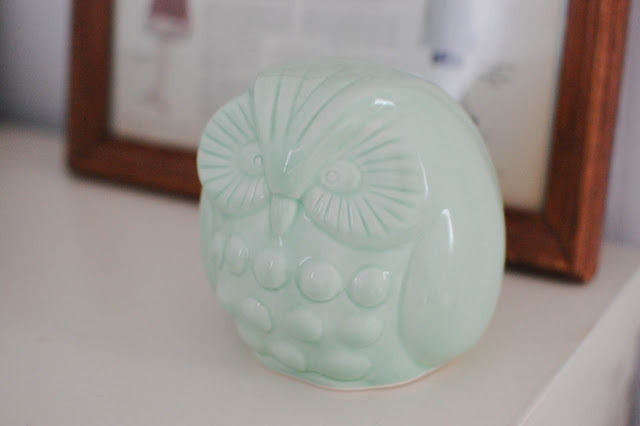 and i acquired this owl bank i had been wanting. pale green is one of my faves. Love the blanket! Do you think it would look just as good in one color? I like grey! Think I could commission you to make me a bow belt in black? 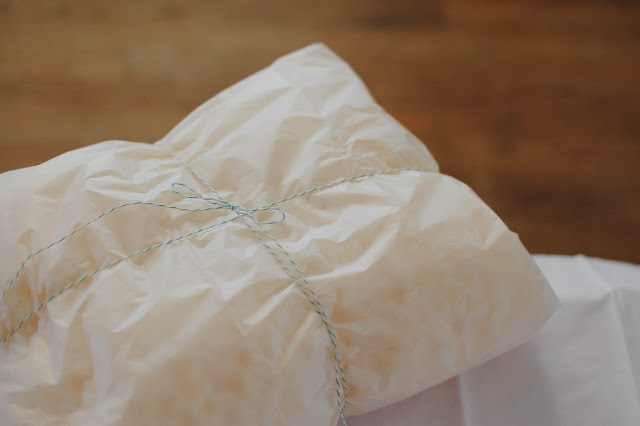 What kind of yarn and hook size did you use? This is absolutely gorgeous! just curious, but what kind of yarn did you use for the blanket? i love the color combo! I was wondering about the yarn and hook too. I love the pattern it doesn't look like the usual worsted yarn. I just wanted to let you know that I pinned this link and pattern on pinterest. I am really excited to try this. I love the look of your blanket! I love this pattern! For a baby blanket (about 30x35") with a 5mm hook, how many stitches would you suggest for the starting chain? 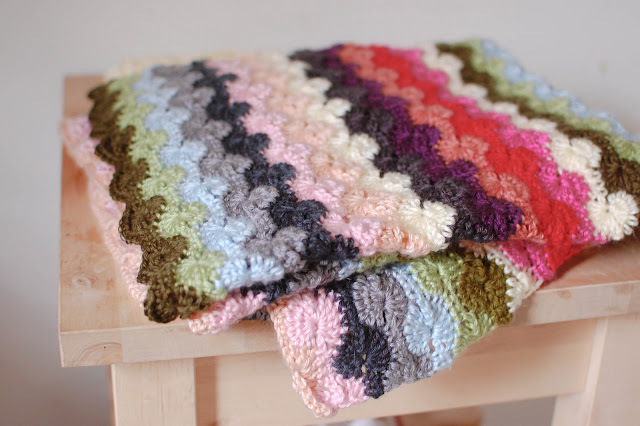 I have begun a version of this blanket for my 5 year old daughter, and I'm really looking forward to seeing it develop. I chose ten different worsted acrylic colors, many similar to the ones you used. FYI, to make her a twin sized afghan measuring about 40" wide, I chained 200 plus 1. I'm currently making this blanket for a friend's baby, and I'm running into the same problem I had when I made this blanket for myself: my sides are very uneven. The right side will veer to the right, and the left side will veer to the right as well..so it just makes it look bent a little.. did you have that problem? I think it may be because of my color changes. Would you mind telling me how you do your color changes? Thanks! I had the same problem! I agree, I think it is due to weaving in the yarn all on one side due to color changes. Perhaps a solution is to weave the ends up the first stitch only and crochet a border all around??? Or cut the yarn on each row even though you are using the same color for two rows? This might balance out the weaving on both sides? Anonymous and A Girl Called Pete, it's probably because you're not starting your row in the correct stitch and/or not finishing the row in the correct stitch. Try starting your row one more stitch in (to the left, if you're right-handed). On this one are you using the Caron Simply Soft yarns that you use in a lot of your other projects? I LOVE the colors of this and I adore how soft that yarn is. :) I just started the circle scarf in this same stitch from your pattern and I LOVE it! Thank you for posting your patterns! Did you use two strands of yarn at once like you did for the circle scarf pattern? This looks beautiful and I can't wait to try it. Thank you! I love this pattern it will be my next afgan project. 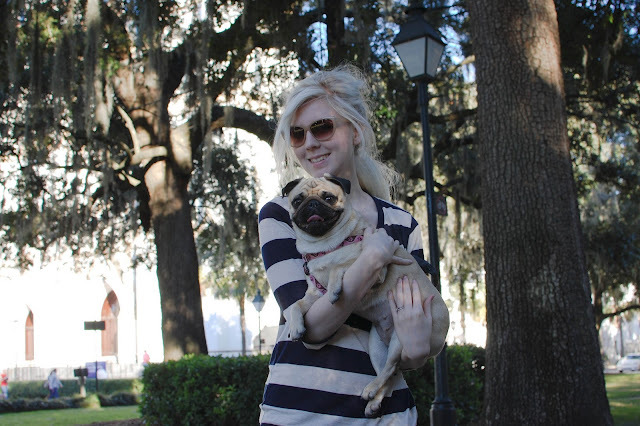 We have two mutual loves....crochet and pugs (I have three pugs)!! Thank you for sharing the pattern. This is a lovely tutorial! I'm an editor for AllFreeCrochetAfghanPatterns.com and I know my readers would just love this pattern. Let me know if I can link to your tutorial with full credit to you and we can get started. Email me with any questions! Thanks for the fab pattern! Made one up with a green and cream Aran yarn for a friends new baby and she loooooves it! On rows 2 and 4, are the directions in () explaining how to dc4tog & dc7tog? Thats the onyl part Im lost on, can't wait to try this! I know you said you already had these yarns, but can you share some brand / color details please?